Editor’s Note: I’ve decided to begin posting some reviews of films screening at Hot Docs 2009 early, hopefully helping anyone attending make some decisions about what to see. 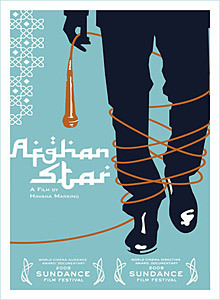 Afghan Star is screening on Wednesday May 6 at 9:15pm at the Bloor Cinema and Friday May 8 at 11:00am at the ROM Theatre. Afghan Star (Director: Havana Marking): The original Pop Idol show started in the UK, but has quickly spread all over the world, with American Idol and Canadian Idol being quite well known here. Though these shows often feature some embarrassingly bad singers, they’re still quite popular because the fans get to vote each week on who stays and who is eliminated. Though we take this kind of thing for granted, when the show was introduced to Afghanistan in 2005, it was revolutionary. People used the SMS text messaging capability of their mobile phones to vote, and for many young Afghanis, this was their first experience of democracy. Afghan Star follows four contestants from the third season in the runup to the finale, and while this could be an exercise in superficiality almost anywhere else in the world, for these young Afghani singers, it’s both a political statement and a chance to follow their dreams of stardom. This mixture of the personal and the political serves the film well, and title cards add any necessary context without the need for an intrusive voiceover. The director includes two male and two female contestants, even while she acknowledges that the overwhelming majority of contestants are male. In Afghanistan, it takes a very special kind of courage to sing on television if you’re a woman. In many parts of the country, women aren’t even allowed to leave the house without their husband’s or father’s permission, and often only if covered head to toe in the confining folds of the burqa. Lema and Setara, the two women finalists, are quite different, even though they share the same incredible courage. Lema, looking much older than her stated age of 25, is from Kandahar, one of the areas of the country where the Taliban seem to be making a comeback. It is so dangerous in her hometown that her music teacher has to come to her house secretly to teach her. Although she takes incredible risks to pursue her ambition, she is rather demure compared to the younger Setara, who seems almost reckless in her desire to express herself, wearing makeup and dressing in the latest fashions. When she is eventually voted off the program, Setara is given the chance to sing one last time for the audience, and shocks everyone by uncovering her hair and actually dancing while she sings. Even the other contestants seem to think she’s done something very dangerous, and indeed she is the subject of death threats soon afterward. The two men are less controversial, though both approach their battle to be named Afghan Star as a political campaign, recruiting volunteers to hand out flyers and put up posters. Rafi is young and good-looking, and seems to appeal to many of the more liberal young people, especially the young ladies. Hameed has a strong support base among his Hazara ethnic group, a group who have historically been subject to persecution. But his training as a classical musician and his singing voice also make him popular across ethnic lines. Although Afghanistan has a strong musical tradition, and everyone seems to love music, it was actually banned under the Taliban regime (from 1996-2001), and the new government is very eager not to offend any religious sensibilities. In this volatile atmosphere, Afghanis like Hameed, Rafi, Setara and Lema are trying to follow their passion for music while in some cases fearing for their lives. What makes the film so affecting is the very fragility of the newfound freedom these young people are so eager to hold onto. Many of the people interviewed are wearily resigned to dealing with often-abrupt changes in government. The past thirty years have seen Soviet occupation, civil war, Taliban rule, and now occupation by US and “coalition” forces. It’s both sad and heartening to know that whatever happens, no one will stop these men and women from singing, even if they have to do it in secret. This entry was posted in Documentaries, Film Festivals, Hot Docs and tagged #hotdocs09, afghanistan, realitytelevision, Television. Bookmark the permalink.